Recapping each team's EYBL regular season is a long, arguous task. Some teams fell just short of Peach Jam contention, and will move on to massive amounts of success in other July tournaments. After looking at Nike Team Florida's EYBL season and getting to know their star guard Haanif Cheatham, two things were established: First, NTF has one of the most efficient guards in the entire country. Second, said guard is going to make a college program extremely happy. Looking at his numbers will definitely impress, but it's the other things that Cheatham does that make him a special player. 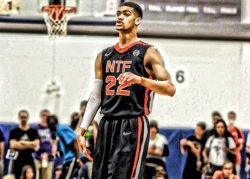 Coming off EYBL averages of 16.9 points (.522 FG%), 3.4 rebounds. 2.5 assists and 1.4 steals, Cheatham displayed the ability to score at the rim and finish with consistency. You would be hard-pressed to find many players who drive it to the rack as hard as Cheatham, as he translates this ability into easy buckets for himself and his teammates. Heading into the live-period and a very active summer for Nike Team Florida, we picked Cheatham's mind on the direct-correlation that comes with elite status - his college choice. Cheatham has impressed us with his play, and proved to be equally as impressive off the court. Soft-spoken and obviously humble, it is evident to tell that Cheatham also has elite guidance. Here's what Cheatham had to say about the most important decision of his life. Alec Kinsky: What would you say is the most important aspect of picking a school? Academics? Playing time? Coaching style? Something else? Haanif Cheatham: A big academic school, a place that I will become a better person off the court and on the court. Playing time would be a big affect. Even though I know wherever I go, I will have to work for my spot. AK: You have plenty of offers on the table, including a recent offer from Cuonzo Martin and California. Which schools are coming after you the hardest? AK: Will staying close to home factor in? HC: Yeah, but I won't let that affect me choice. Staying home won't be (a factor) in my final decision of me picking a school. AK: Which schools are coming after you the hardest? HC: Recruiting me the hardest would be VCU, Kansas State, Marquette, Florida State, Wichita State, Cincinnati and Tennessee. AK: When are you looking to make a decision'? AK: Any of the coaches do anything unique to recruit you? HC: Not really. You know, the simple texting, calling every night to check in. It's all good.